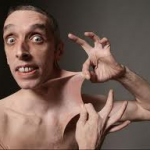 Ehlers–Danlos syndrome (EDS) (also known as Cutis hyperelastica) is a group of inherited connective tissue disorders, caused by a defect in the synthesis of collagen (Type I or III). The collagen, often referred to as “glue”, in connective tissue helps tissues to resist deformation. Collagen plays a very significant role in the skin, joints, muscles, ligaments, blood vessels and visceral organs; abnormal collagen leads to increased elasticity within these structures. Depending on the individual, the severity of the mutation can vary from mild to life-threatening. There is no cure, and treatment is supportive, including close monitoring of the digestive, excretory and particularly the cardiovascular systems. Physical therapy, bracing, and corrective surgery may help with the frequent injuries and pain that tend to develop in certain types of EDS, although extra caution is advised and special practices should be observed to prevent permanant damage. This entry was posted in Oral medicine and tagged Adducted Thumb-Clubfoot Syndrome, collagen, Connective tissue, ehler-danlos syndrome, elasticity, joint hypermobility, joint instability, lysyl hydroxylase, scoliosis, tenascin deficiency eds, translucent skin, vascular eds on June 17, 2012 by chzechze.